The Clubhouse is a modern facility and is located on a bus route, along with being walking distance from several accommodation houses and the beautiful iconic Noosa River. Too far to walk? CALL OUR COURTESY BUS on 07 5449 7155 (Press Option 1). We have an expansive general bar area with many beers on tap, a popular wine list and a variety of other beverages to quench your thirst. On Wednesday and Friday nights we have our popular Meat Raffles, Member’s Badge draws and live music, all starting at 6pm. This area has a pool table for use plus a Keno facility and 25 modern poker machines, which are constantly updated. The adjacent area houses our ever popular Bistro, especially now that we have Darren “on the tongs”. The Bistro also doubles as the Club’s function room which can be hired out for catered events, seating up to 200 people. Got an event to plan – Weddings, Corporate Functions, Birthdays. You name it and we can assist with all your needs with a variety of dining packages to choose from….and remember drinks are at Club prices. Don’t feel like eating in The Bistro? Simply place your food order and our Bistro staff will serve your meal to the bar area. Looking for food for your entire function or event, click below to view the Functions Menu. The Club also has Board Room facilities for hire upon request. The facility can be set up as 14 people seated comfortably at tables or 24 people seated in theatre style. We include a whiteboard and projector for your use. Cost is $50 per half day or $100 per full day and is available from 9:00 am. Please contact us for further information on 07 5449 7155. Cost – $10 per person (daylight hours) $12 per person (under lights – minimum 12 players). A non-refundable $50 deposit is required for groups of 30+ players. An instructor will be on hand to give you a rundown of how to play. 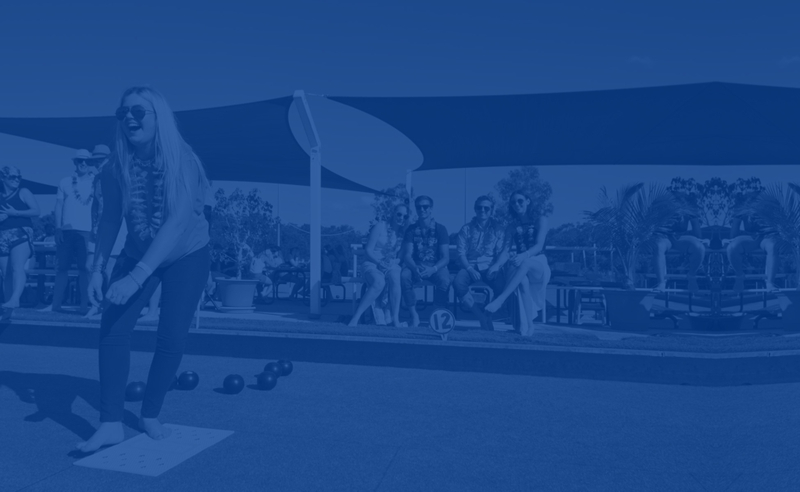 Children – children over the age of 10 are welcome to enjoy barefoot bowls. Children under 10 are not permitted on the Greens, and must be supervised. Wet Weather – in the case of rain showers, you are still welcome to play. In the case of downpours or continual rain, we can credit your green fees to the bar or a credit voucher for another day.